wafting from the distant sands and mounds of red chillies drying in courtyards ready to be pounded. 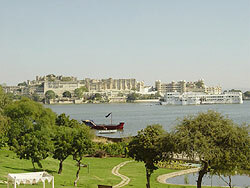 Jaipur Hotels, Jaisalmer Hotels, Jodhpur Hotels, Udaipur Hotels. 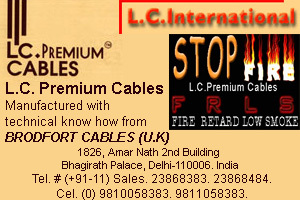 going to Jaipur, Jaisalmer, Jodhpur, Udaipur and Ajmer. Ranthanbhore National Park are musts on every tourist's itinerary. continuous human habitation of the area dating back 100,000 years. with Rajput strength reaching its peak at the beginning of the 16th century. supremacy in the region. Rajasthan soon emerged as a centre of Indian nationalism. When the new constitution went into effect in 1950, Rajput princes surrendered their powers to the Indian Union. of savage summer heat but also full of the brightest colours. for the people, life is one big carnival, even in the face of sure death. death to dishonour. Even in everyday life today, the Rajput's sense of honour, family and tradition come foremost. there is a rich literary tradition, especially of bardic poetry. of which dates to the 12th century, is particularly notable. Rajasthan is the 'ghoomar', which is performed on festive occasions only by women. (in which male dancers ride dummy horses) are also popular. 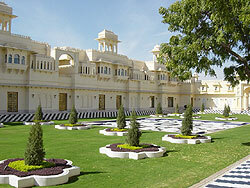 has perhaps India's largest centre of semi-precious / precious gems and stones. there is no end to what Jaipur offers to shoppers. 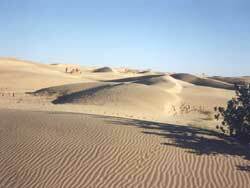 There is a wide range of climate, varying from extremely arid to humid. daytime maximum temperature hovering at about 43º C in many locations. southwest, rainfall is higher, in part owing to the summer monsoon winds off the Arabian Sea and Bay of Bengal. The best time to visit is around Mid-October to Mid-March. During the monsoons, Rajasthan is a delight. POPULATION IN RAJASTHAN : 50 million.